How much will magazines, newspapers or TV channels pay for my story? I need to find out how much will a magazine or newspaper pay for my story… is a question we are asked every day. In short, every story is unique, so the price it commands is different every time. However if you’re after a rough guide, read on. Sell your story exclusively to the highest bidder. Send your story to all publications via the ‘newswire’ and get paid a commission for what is used. The majority of agencies will only have the facilities to offer one method of selling your story, whilst SWNS (the UK’s largest and most respected agency) can offer both. In most cases the most lucrative way of selling a story is exclusively to a magazine or newspaper. If your story is deemed a ‘feature’ rather than a ‘news’ story (we can advise) your story can be auctioned by us to the highest bidding publication (i.e who is willing to pay you the most for the rights to print your story). If you’re happy with the highest offer, your story will be printed and you’ll get paid… it’s as simple as that. Exclusivity is key, so you may jeopardize your fee if you send it around to numerous people or try to tout your story out too much. We’ve seen people lose vast sums on the basis of making too many people aware of the story. Essentially, most agencies do the same job and you will not earn more by playing them off against one another, just choose one and stick with them (hopefully that’s us!). It only causes confusion and can lead to some ‘unscrupulous’ agencies using your story without your permission, meaning that your ‘exclusive deal’ goes up in smoke. Once we sell your story exclusively (known as ‘first rights’ in the industry) we are able to sell your story to other publications on ‘second’ and ‘third’ rights basis (if there is further demand to print your story). Your offer will depend on a number of factors, but primarily what your story is about, what photos you have available, and what the demand is for that type of story at the moment. All newspapers and magazines have different budgets relating to their circulation size and advertising revenue. Fast-paced women’s weeklies and daily newspapers pay more for real-life stories than glossy monthlies and weekly newspapers due to the time constraints and competitiveness of getting a weekly/daily issue ready. You’ll see inside many magazines the rates they will pay “up to”. Sometimes this leads to unrealistic expectations because that figure could represent the maximum figure they’ve ever paid out for a story. Most women’s magazines and national papers will pay around £300-£500 for a story which makes a two-page spread. But this can be £1,000 to £2,000 depending on how good the story is. You might get £50 or £100 for volunteering as a case study or sending in a wacky pet story, or you can expect hundreds or thousands if it’s a very unusual or topical story. Generally the magazines and newspapers try to set a fair price. You can expect your fee offer to cover your time and trouble for telling your story (over the phone or in person), providing photos, or even having some photos taken. The payment will be made directly to you or we can make a donation to a charity of your choice (which can also be mentioned within the article in some cases). This service is entirely free to you. SWNS is paid separately by the magazine or newspaper for supplying and writing the story to the style of the publication. If your story or picture has more of a news angle, or it needs to be printed as quickly as possible, we will send your story out via our ‘Newswire’ service. This means that your story or picture is sent out via an automated system (run by SWNS) to every magazine and newspaper in the country. Anyone that chooses to can use the pictures or words, and you’ll be paid for the column inches that it takes up, or the size, quality and page that the pictures appear on. Please be aware that many press agencies do not access to the SWNS newswire. Selling your story exclusively will bring in much higher fees, however although you’ll only be paid a few pounds for each photo or column used on the Newswire, the money can add up if lots of newspapers use the story. Putting your story out via the Newswire Service is also something to consider if there isn’t any interest in your story via the Story Auction. Putting a story out as News content is far less lucrative, but in many cases, magazines will have a lot more interest in your story if they have seen it in a few newspaper columns first – so we often use the Newswire service to encourage interest in your story. 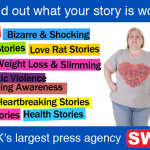 We are also able to send your story out via the newswire after your story has been sold exclusively to make sure that you squeeze every single pound out of your story. Typically, with your permission, we would ensure you obtain the maximum fee for your story by first selling it exclusively, and then offering it out on the newswire. For more information about the story selling process, read our Sell My Story page or refer to our FAQ page. If you still aren’t sure about the process, our team would be happy to answer any questions you might have or provide any advice about the process. See our Contact Us page.